SALISH SEA — A human-powered flotilla will return to the Southern Gulf Islands in the summer of 2016, spreading a message of hope and change for solutions beyond the carbon-based economy. “Turning the Tide: the People’s Paddle for the Salish Sea” will bring together up to one hundred kayakers, canoers, open-water swimmers and sailors in a 5-day, 4-night journey in July 2016. The flotilla, which is celebrating its 3rd annual event, is open to the general public and intended to provide a family-friendly journey to raise awareness of social and ecological issues and build community among islanders in the Salish Sea. 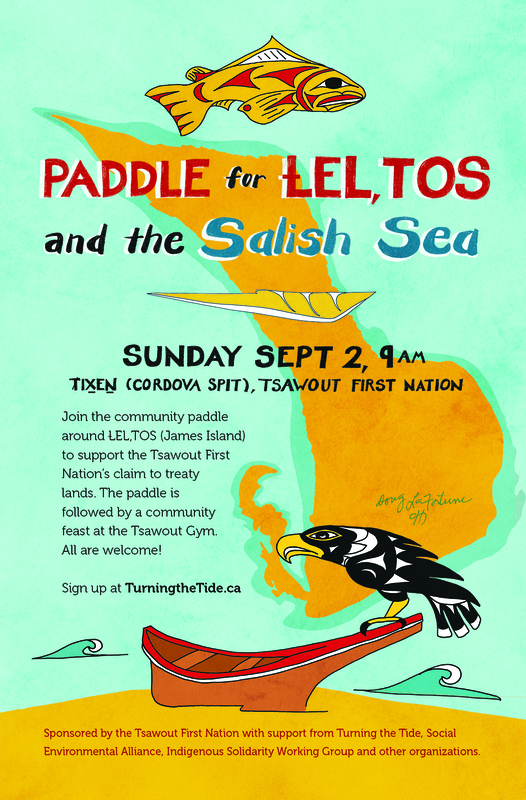 Turning the Tide 2016 will include stops on Pender, Mayne and Salt Spring Islands, with musical performances, educational workshops and outdoor recreational activities for paddlers and islanders. Registration for Turning the Tide 2016 has opened at http://www.TurningtheTide.ca. The early-bird fee of $70 ($80 after April 1st) includes camping and dinner on all-islands. Members of the public should be sufficiently comfortable and skilled in the watercraft of their choice to undertake this 70-kilometre journey through the coastal waters of the Salish Sea.